Vauxhall has revealed the new Astra VXR at the 2012 Geneva Motor Show. Powered by a 2.0-litre turbocharged engine with 280PS and 400Nm of torque, the high performance hatch will be the fastest production Astra ever built and will cost £26,995 when it goes on sale later this year. 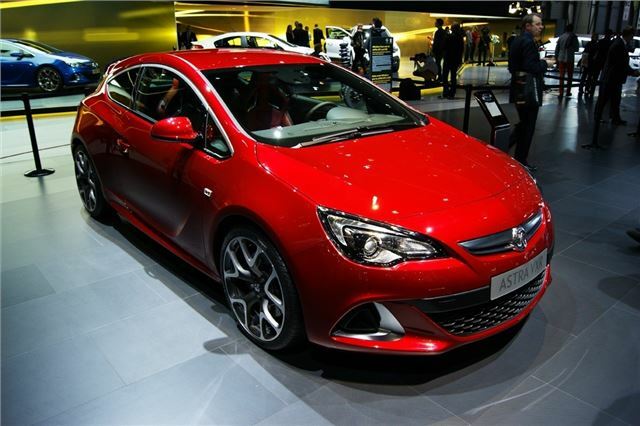 The new model is based on the recently launched three-door Astra GTC and comes with a bespoke chassis and a newly developed mechanical limited slip differential, designed to give the VXR plenty of grip and traction. Hopefully it will be an improvement on the previous VXR which was certainly powerful, but lacked finesse. Other changes include brakes developed by Brembo and Vauxhall’s fully adaptive FlexRide system as standard. In the Astra VXR, FlexRide has a Sport button and also a VXR button, which gives two, more focused stages of damper, throttle and steering control. To make the VXR stand out from the standard Astra GTC, it comes with different bumpers, side skirts, a roof spoiler and dual exhausts at the back. Inside there are performance seats, a flat-bottomed VXR steering wheel and new instruments. Along with the VXR, Vauxhall was also showing the new Insignia BiTurbo, fitted with the most powerful diesel engine ever from Vauxhall, a 2.0 CDTi with 195PS.